An independent panel was split 2-1, but nonetheless upheld the straight red card issued to Chivas USA midfielder Agustín Pelletieri for “fighting” (later changed to serious foul play for reasons never explained) in the 13th minute of Sunday’s game against the Vancouver Whitecaps in Carson. It appears the panel upheld the referee’s ruling after Pelletieri’s cleat lingered on the lower leg of Vancouver midfielder Pedro Morales after the tackle, which you can see in the above video. The ruling seemed harsh to most observers, including Chivas USA coach Wilmer Cabrera, who declined to discuss the incident or the referee during his post-game press conference. MLS did not say which panelist dissented against the decision. The panel consisted of representatives from the U.S. Soccer Federation, Canadian Soccer Association and Professional Referees Organization. The ruling means Pelletieri’s automatic one-game suspension will stand and he will miss Chivas USA’s next game this Saturday in Dallas. Meanwhile, MLS and its locked-out regular referees have apparently resolved their differences over a labor contract in time for the weekend’s third round of games. Just in time, many fans and, presumably, Cabrera would say. The Galaxy’s failure to advance to the semifinals of the CONCACAF Champions League Wednesday in Tijuana was magnified by the manner of the 4-2 aggregate loss: LA conceded two goals inside nine minutes and a third inside the opening half hour. That quick 3-1 turnaround from a 1-0 lead going into the game meant the Galaxy were never likely to overcome such a deadly opening salvo against class opposition even if on paper the away goals rule meant progression in the tournament was as tantalizingly close as just one more goal. In practice however that was never likely with Club Tijuana clearly superior to the Galaxy on their familiar fake field before zealous fans even if Galaxy coach Bruce Arena sounded unwilling to publicly proclaim how much better the hosts were than the MLS outfit. Next up for the Galaxy: Real Salt Lake Saturday in Utah. Last Sunday’s Manchester-United clash was the fifth most-watched EPL game ever on cable, according to NBCSN. The sports network announced that an average of 779,000 viewers watched Liverpool dismantle once-mighty United 3-0. NBCSN has had four of the top five most-watched EPL games in cable history in the two years since it began broadcasting. The game was part of a doubleheader with the north London Arsenal-Spurs derby and an average of 725,000 viewers watched both games, making it the top-viewed cable doubleheader in EPL history. To put all these figures in perspective, consider that the 37 MLS games on NBCSN in 2013 averaged a puny 112,000 viewers, according to Wikipedia. And, just to get you ready early for the upcoming slate of games this coming weekend in the EPL, which includes a match between first-place Chelsea and third-place-Arsenal Saturday, check out the comprehensive, stat-packed preview to all the games here. So it was a soft goal for Tijuana to concede and a lucky one for the Galaxy to score, but the Galaxy have a slim one-goal cushion after last week’s first leg win in Carson as American clubs look to best their Mexican counterparts this weekend in the oft-overlooked CONCACAF Champions League. I take a look at the U.S. chances in this week’s column. Well, OK that’s actually “Rise as One,” but I’m guessing my title is pretty apt. 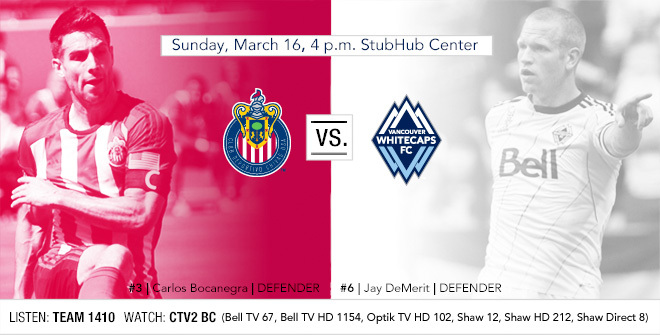 The nationally televised clash between Seattle and Toronto kicks the weekend off at 1:30 p.m. today on NBCSN with fans perhaps about to see the MLS debuts of big money signings Jermaine Defoe and Michael Bradley for the Canadian outfit, although both have battled injury problems recently. And who would have thought former goal-shy Galaxy striker Chad Barrett would immediately benefit from the presence of Clint Dempsey for the Sounders last weekend, picking up his scraps with a dramatic winner from a rebound in second half stoppage time to beat Sporting Kansas City? The Galaxy’s week 2 encounter with D.C. United was postponed because it was sandwiched between midweek CONCACAF Champions League games against the Xolos, but Chivas USA meets Vancouver at 4 p.m. Sunday in Carson in the only game of the weekend between MLS clubs that both won their first outing of the season. Check out those standings, Chivas USA fans. I’ll have more on that later, but here are the predictions of Southern California soccer scribes for this round of games. The U.S. is not expected to win the World Cup in Brazil this summer, but its fans rank tops in several aspects of travel to the tournament, according to online travel company Webjet.com, which created the nifty graphic below. And if you’re not one of them (yet), check out this link for a chance to win tickets to World Cup games. The pick of the EPL games this weekend are both on Sunday, making for an engrossing morning doubleheader on NBCSN: at 6:30 a.m. its Manchester United-Liverpool and at 9 a.m. it’s the north London derby between Spurs and Arsenal. You can find your EPL game here. For a comprehensive preview of the entire slate of games, click here.